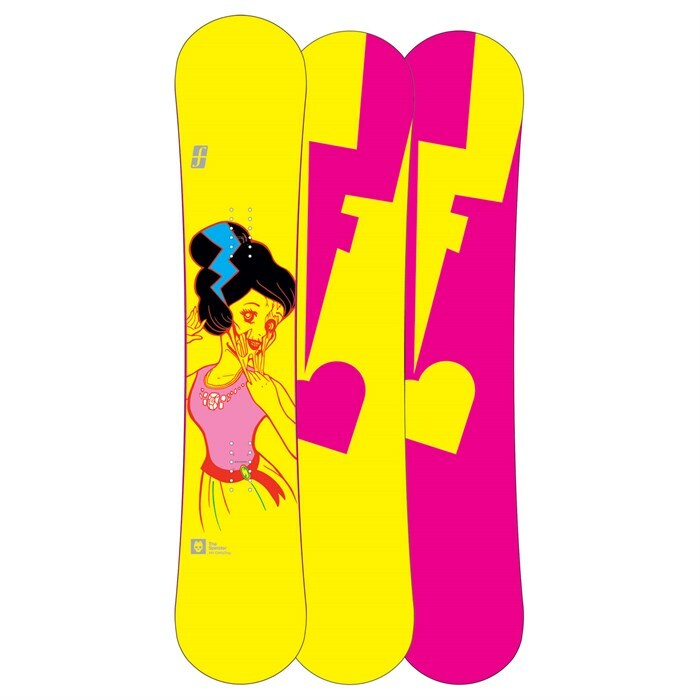 Forum Spinster Chilly Dog Snowboard - Women's 2011 – Old, frail, and delicate is definitely what you’re not. The Forum Spinster Chilly Dog Snowboard is made for the aggressive park girls who hit the biggest jumps and square up the biggest rails. The Women’s ChillyDog profile provides a forgiving continuous rocker shape that’s specifically built for a woman’s riding needs and is supercharged on speed with the FreeBase. Take this board and go celebrate the irony. The Forum Spinster Chilly Dog Snowboard is park board that’s as light and spry as its name isn’t, with a flex rating of 3 that’s plenty forgiving for your ride. Swingers Club tech means that the tip and tail of the wood core is shaved to reduce weight without sacrificing durability, meaning the board spins faster and floats easier whenever and wherever you want. Forum proudly introduces their new Women’s ChillyDog profile in this twin board, a rocker that’s built from the ground up with the female rider in mind, providing stability, predictability and a forgiving ride for women’s bodies. This profile features a slightly lower rocker height and a softer core profile between the feet to accommodate female riders. The FreeBase in the Forum Spinster Chilly Dog Snowboard is a smokin’ base whose slick material waxes easy for speed, emphasize die-cut graphics, and protects the core from getting worked on run-outs through the parking lot.